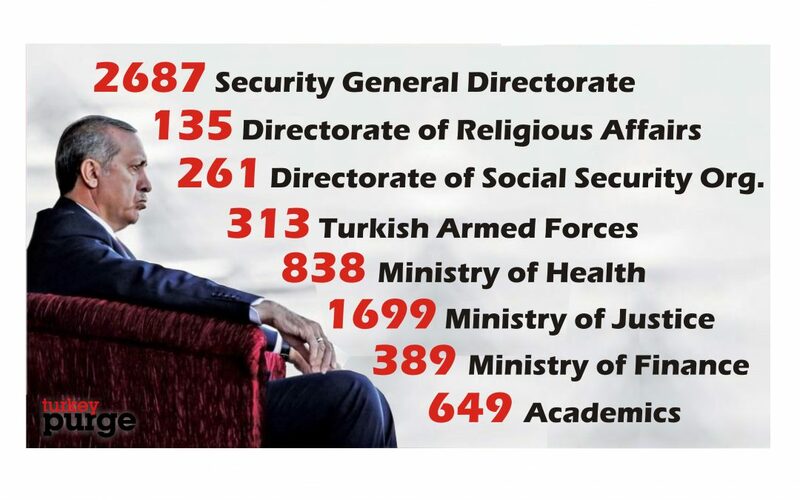 With new state of emergency decrees issued on Friday, the Turkish government has shut a total of 83 more associations operating in various regions of Turkey, dismissed 149 soldiers from the naval forces, 164 from the air force and 649 academics are from universities. According to the tree new decrees, numbered 679, 680 and 681, a total of 838 civil servants are dismissed from the Ministry of Health, 2687 police officers as well as 8 staff of the Council of State, while police is now given access to the identity information of the internet subscribers. LIST 2 — Directorate of Social Security Organisation, Ministry of Environment and Urban Planning, Ministry of Youth and Sport, Ministry of Food, Agriculture and Livestock, Ministry of Customs and Trade, Ministry of Finance, Revenue Administration, Turkish Armed Forces, Academics. LIST 4 — Ministry of Family and Social Policies, Ministry of Culture and Tourism, Ministry of Finance, Ministry of Health.